The beach is fun for any age, whether relaxing in the sand, surfing the waves or exploring the area’s abundant water sports. (NAPSI)—Good news for those who want to spend their vacation disconnecting from society and reconnecting as a family. There is a vacation destination designed to help visitors fulfill that desire. 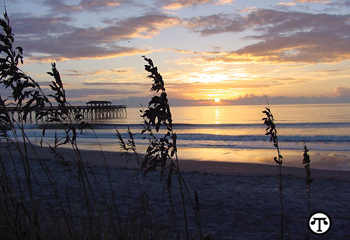 The Myrtle Beach area of South Carolina is built to suit what some call the “togethering” experience. With more than 60 miles of coastline peppered with accommodations to fit virtually any family’s size and budget, vacationers can choose from oceanfront beach homes, multi-bedroom, condo-style high-rises or oceanside camping grounds to keep the family close by. The area has a wide variety of entertainment options, including ocean attractions, such as the Myrtle Beach State Park or Springmaid Pier. For activities that can get the adrenaline pumping, the area has everything from zip lining and parasailing to NASCAR race car driving. Those seeking a vacation experience with a bit of history or culture are also in luck. They can visit a historical home such as Hopsewee Plantation, check out local art at an area museum or learn to cook a favorite regional dish like tasty she-crab soup. For those seeking picture-perfect family photos, the area known as the Grand Strand has plenty of memorable backdrops, from its 60 miles of coastline to the iconic attraction known as the SkyWheel. For more information on the Myrtle Beach area, go to www.visitmyrtlebeach.com.